Street Pastors is an initiative of Ascension Trust and was pioneered in London in 2003. On that first night, 18 volunteers took to the streets of Brixton – 15 women and 3 men. 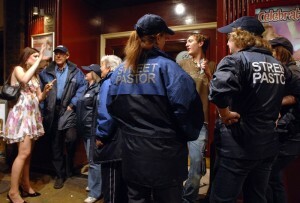 There are now 11,000 trained street pastors, and they play an active part in 270 towns and cities around the UK. There are a growing number of Street Pastors teams overseas. Street Pastors engage with people on the streets to care for them, listen to them and help them. They work together with other partners in the night-time economy to make communities safer. The first Eastbourne Street Pastors were commissioned in February 2010 and since then Street Pastors have been on the streets of Eastbourne every weekend, listening, caring and helping. Our team comprises of people from churches across the town. Servant hearted men and women aged from early 20s to mid 70s, you will struggle to find a better group of people.